Ableton’s Push, like other colored, light-up grids, may sometimes seem like just a big, flashy Lite-Brite. So – heck, why not use it that way and have a good time? Tama Rhodes writes us to let us know about a project that exploits the shiny colors to visualize live sound data. 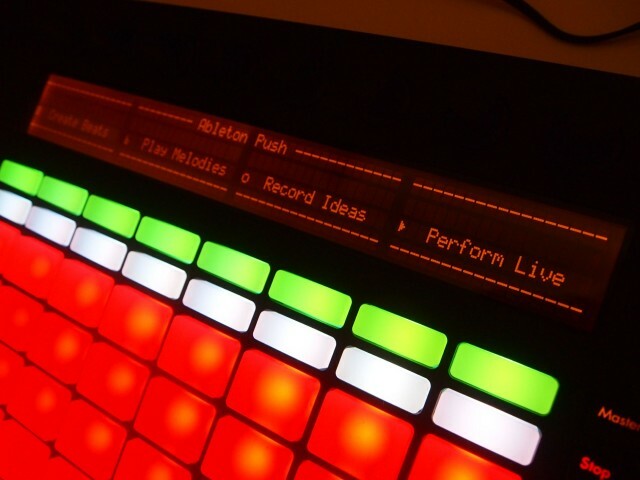 The results are screaming for a live performance in which the Push is tilted toward the audience as you play, a technique Daedelus has long used with the monome. What’s doubly impressive – and why you should download this to learn from it even if you don’t want to do this with your Push – is that all of this is taking place with default Live devices. There’s no Max for Live patching or anything of the sort. Clarification: the creator did no patching, but this does use the Max for Live-powered Envelope Follower. So you do need Suite. And while we rather like Max for Live patching, that demonstrates what’s possible with even these basic devices, suggesting possibilities you might not have previously considered. I’ve made ​​this only using Ableton Live 9 & Push. Max/MSP programming is not difficult to make like this. But this is interesting more than programming. Download the Pack, Install, Press USER mode & Play your music! Push, In-Depth Test: What’s it Like Playing The New Hardware from Ableton? Got more Live and Push hacks? We’d love to see them.